Although it was a maiden on a Thursday at Bendigo, trainer Danny O'Brien couldn't have been more excited and relieved with the impressive win of Portman. The Makfi four-year-old was having his first start in more than nine months and just fourth of his career, when he careered away untouched for jockey Craig Williams in the 1100m open maiden event. "We have always had an opinion of him, but he has been hard to keep in one piece," O'Brien said. 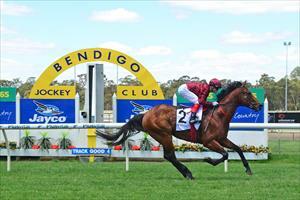 "After his encouraging third on debut at Flemington as a two-year-old, he picked up pneumonia and we almost lost him. He recovered, but never really measured up in his two starts as a three-year-old as he needed time given he was a big gross horse having knee issues. "We gelded him at the start of this preparation after giving him an extended break and today we got to see what he has shown us at home so many times." O'Brien said he expected to have fun through the summer with the horse he owns in partnership with Qatar Bloodstock. "He could not have been more impressive today and on the strength of that win I would expect he will be able to go on with it and race through his grades this preparation."